Our studio offers full interior design services including concept design. Project design development, architectural drawings and 3D visualization, brand identity and graphic design, on site inspections and interior architecture applications. Collaborating with CA2O architects from Istanbul, the concept of the interior design of Hilton Residence lobby is being realized by combining Merve Kahraman products with contemporary interior style. Ongoing project of a Fur and leather store design located in the famous grand bazaar of Istanbul, Turkey. Harmonizing with the history of the bazaar, the interior is very pure and graceful with white marble elements and shiny copper details. 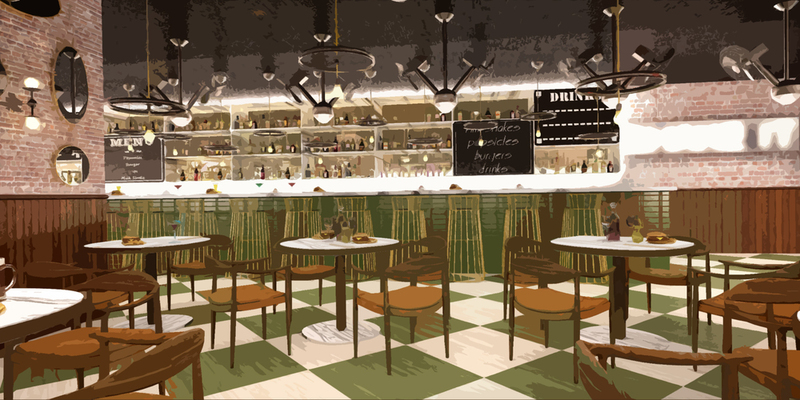 Conceptual Design project of a new gourmet burger restaurant in Jakarta, the capital of Indonesia. Aiming to be a new hotspot for the young, creative and succesful clients of the Capital city, the interior has been designed with playful elements reflecting the character of Burgo. Natural materials such as wood and marble has combined with color and geometrical shapes to create a unique and fresh dining experience..